There are very few apartments in St.Anton where you can literally ski in / out but this great apartment is just such a place! Situated right on the slopes so that you can literally walk out of the door onto the slopes! It has two good sized bedrooms and will sleep 5 – 6 people. 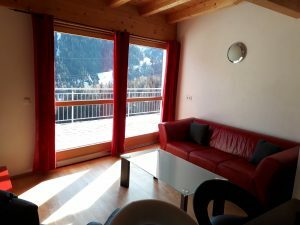 The apartment is spacious with front and rear balconies giving you great views over the slopes and St.Anton. This will be one of the best places to watch the New Year firework display. There is also a laundry room with washing machine and dryer and a boot and ski locker room. It is also possible to combine this apartment with the one bedroom apartment next door giving accommodation for 8 / 9 people. 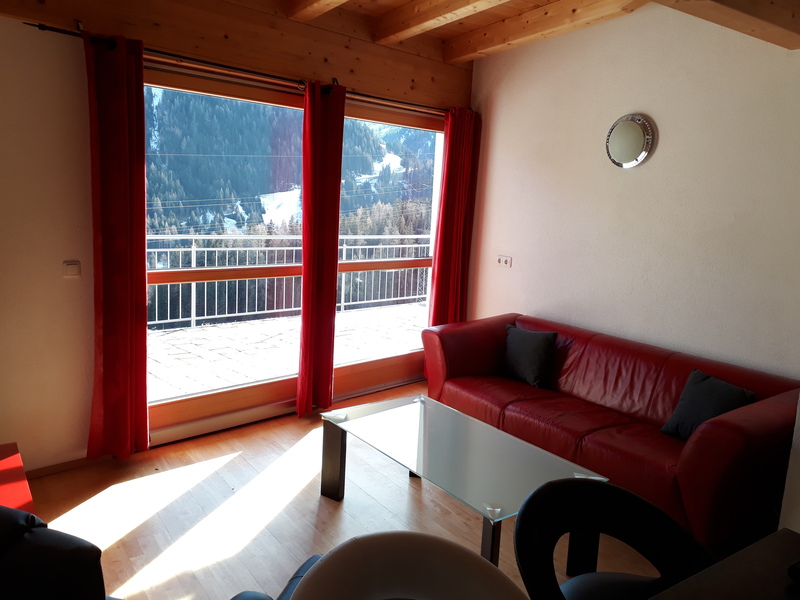 The apartment has a large and spacious living and dining area with full height wall to wall windows giving you great views across the slopes. There is a corner sofa as well as a large dining table with seating for 6. One of the highlights of this apartment is the large balcony that leads of this living area and from here you look straight down the slopes with great views over St.Anton. There is a HD TV with dvd player and also a bluetooth MP3 player for your entertainment. We supply dvd’s including plenty of films for children. The bedrooms in this large apartment are both of a good size with plenty of space and storage cupboards. There are bedside tables and also bedside lights. The ceilings are high and add to the nice feel of these rooms. The first bedroom is very large and spacious. It has three single beds and a double wardrobe with plenty of room for all of your clothing and ski gear. There is also a balcony off this bedroom giving views behind the apartment to the slopes. The second bedroom is also of a very good size, airy and spacious. It has two single beds and again plenty of wardrobe and storage space. It is possible to put a fold out bed into this room to sleep a sixth person. The balcony at the back of the apartment is accessible from this bedroom giving views to the slopes. The kitchen is well equipped with everything that you should need. There is an oven & hob as well as a microwave. All the utensils are also supplied including kettle, toaster, egg steamer and coffee maker. The table has seating for 5 people.The one bathroom has a large wash basin, shower cubicle and toilet. There is a good sized mirror above the basin and a hairdryer is supplied too. We supply all bed linen and large top quality bath towels and hand towels. There is also a washing machine and dryer for your use and there is ski and boot storage in the entrance area as you come off the slopes. This apartment is literally right on the slopes and is situated above one of the famous St.Anton apres ski bars. The bar closes at 7pm but even when the apres ski is in full swing the noise is not particularly intrusive. 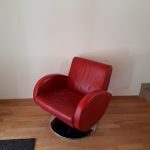 After 7.30pm you will find this apartment to be one of the most peaceful places in St.Anton therefore it is a great apartment for those visiting St.Anton with a youngish family. Best of all is that in the mornings you can get you kids kitted up and ski directly down to the Galzigbahn or Gampen chairlift. In the afternoon after skiing you can ski straight back to the door of the apartment. 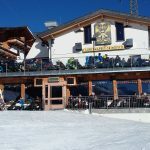 Of course for those looking to enjoy the great apres ski that St.Anton is famous for this is also the ideal apartment because you will be right in the centre of it. There are also three or four very nice bars and restaurants within 2 or 3 minutes walk from the apartment. For those wishing to go to the village centre for the supermarket or to enjoy the nightlife we also include a free taxi service in the evenings.